Spacious two bedroom first floor apartment, situated across the road from Connolly Station and the adjoining IFSC. The apartment of c.67sq.m. (720sq.ft.) has recently undergone a complete refurbishment, finished to a high specification and presented in turnkey condition. This bright and airy unit was redesigned to include two bathrooms, a storage room and a utility area. The apartment also boasts a newly fitted shaker style kitchen, upgraded radiators and secondary glazing to soften any noise pollution and provide extra resistance against the elements, making this a cosy and quiet oasis. The reconfigured accommodation briefly comprises an entrance hall, large open plan kitchen/living/dining room, two double bedrooms (with fitted wardrobes), two bathrooms, a plumbed utility area and a large storage room. 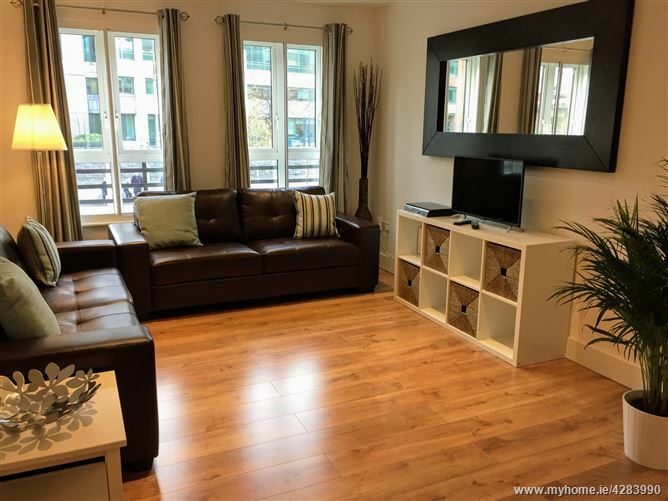 Built in c. 1997, this development is ideally located in the heart of the city centre within a stone’s throw of Connolly station providing DART and LUAS links within the city and a rail network throughout the country. O’Connell Street and Henry Street with their iconic stores are within a short stroll, as well as an abundance of restaurants, pubs and grocery stores, all on the doorstep. This well maintained, gated complex boasts a large courtyard area with attractive planters stocked with a variety of plants and shrubs. This apartment also comes with the benefit of a designated underground parking space. Travelling North on Tara Street continue on the bridge over the River Liffey, keep to the right as the road forks and then continue straight under the bridge. Then keep to the left as the road forks again and continue through the traffic lights, you will see Connolly station on your right and Amien Square is on your left hand side.